If you have a cat, cat food bowls are a necessity. They come in a wide assortment of styles, color, materials, and prices. You can find inexpensive disposable cat dishes as well as beautiful, hand painted ceramic cat bowls. So you’ll have many options to choose from. And you’ll also have lots of fun when looking for the perfect cat dish for your cat. There are different types of cat food dishes. From traditional cat dishes, which come in different styles and materials, to the modern automatic pet feeders, you will certainly find the right feeding item for your cat. Maybe your cat will not care what size or color her bowl is, but you can choose from an ample array of designs and colors. For instance, you can get beautiful stoneware with cute designs as well as original hand painted ceramic bowls (some even come in sets). You can even find stylish cat dishes decorated with rhinestones (that’s right). If you (and your cat) prefer something simpler, try stainless steel or plastic cat bowls. But to be honest with you, I prefer ceramic bowls as they are cleaner (they retain less bacteria than plastic ones) and are more eco-friendly than plastic bowls. If you have a busy schedule or are away from home for long periods of time, you can take advantage of the automatic cat feeders. Many even come with timers you can use to set how often the bowl is filled with fresh food. Cats can be messy too, so a disposable dish might be the perfect solution to this problem. You can find plastic dishes, which come with disposable bowls/liners at several pet stores. However, even though many of these disposable liners are recyclable, they are not biodegradable. If you’re planning on traveling with your cat, you can find travel pet feeders. These pieces come with a food storage compartment and a built-in bowl, all in one piece. These food dispensers are very convenient for both you and your cat. Stands to raise your cat’s bowls. These pieces are especially a great idea for older pets and pets with health conditions or disabilities that make it hard for them to bend over. You can even find adjustable stands. Mats and liners. Cats can be messy during their meal time, so a mat may be of great help. Remember to clean the mat after each feeding. If you are giving a cat lover gift basket, you may include a cat food bowl. Give a matching set of food and water bowls. Personalize your gift! Some online stores allow you to personalize your gifts, including your cat food bowls. Give a bowl for your friend’s cat along with a cat-themed mug for your cat loving friend. Give a set of automatic cat feeder and automatic cat fountain. 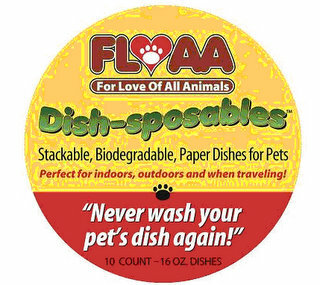 Visit them at www.floaapetdishes.com, or call them at (866) 284-5423.